If the BRICS grouping seeks to achieve their overarching goal of reconfiguring the existing world order, they sail or sink together. The 5th BRICS summit in the breezy coastal city of Durban created quite a buzz in the strategic think tank community around the world, which thrives on projections and scare scenarios. It is, therefore, not surprising to hear sceptical sniggers about the BRICS-led Development Bank – the showpiece outcome of the Durban summit that is projected as a rival to the West-dominated Bretton Woods twins. These sceptics are not entirely at fault: the summit was preceded by feverish speculation about the BRICS leaders officially announcing the launch of the bank with its basic structures in place. In the end, the leaders of the five emerging economies, so the sceptics say, only reaffirmed their resolve to launch the bank and left the details to their finance ministers and mammoth economic bureaucracy. True, a lot of hard and focused work remains to be done to get the bank in place, but the fact that the leaders of the five BRICS countries, with their distinctive trajectories of economic growth and national priorities, could join hands and declare the “viability” of a BRICS-led bank in times of the continuing slowdown is in itself a signature achievement. The delay in announcing the details of the bank also underlined the maturity of the grouping and signalled an implicit recognition that the leaders wanted to move beyond showmanship to establish a real and solid bank that will provide the developing world a viable alternative to the Washington Consensus that animates the World Bank and the IMF. Act in haste, and repent at leisure, as the saying goes. The post-Durban roadmap for the BRICS, therefore, will entail intense negotiations and some give and take among major players inside the grouping. The finance ministers have been tasked with getting the details right. The basic structural features of the bank, including the initial corpus capital; the governing board; and headquarters of the bank will test the strength of the mortar that binds the BRIC(k)S of an emerging world order. One can expect some power-play as decision-makers in India and China are not on the same page on the initial corpus. While Indian officials say the Bank could get going with $50 billion, the Chinese side is insisting on $100 billion seed capital. From New Delhi’s point of view, the $100 billion corpus could distort internal balance within the grouping and may give unfair advantage to China, the largest economy with $3.2 trillion foreign exchange reserves. Indian officials underline that equity is the cardinal principle that should underpin the bank and warn that any deviation from this principle could lead to a replication of asymmetries of the Bretton Woods institutions – the favourite target of the BRICS. On the location of the bank, the months to come will see intense politicking and lobbying as South Africa, the rotating president of the grouping, leaves no stone unturned to make the Bank a symbol of the African renaissance. Besides the evolution of the bank, the world will be watching closely the progress in intra-BRICS trade and investment. On this front, optimists are likely to win the wager as the Durban summit brought cheer to all those who were looking to cut out the rhetoric and do what they know best – business. The Durban summit has already created a $100 billion strategic reserve of foreign exchange that could be an option of last resort to a BRICS country caught up in a balance of payments crisis. It’s a notional fund as the reserve money will remain parked in central banks of the five countries, but the mechanism is freighted with symbolic significance as it underscores the collective commitment to cement intra-BRICS economic architecture. The launch of the Business Council in Durban and how the council brings together investors and entrepreneurs of the five countries will be something to watch. The council is expected to meet twice – expect a meeting in September around the G20 summit in St. Petersburg. What will be more important is the self-driven initiative of the private sector to propel intra-BRICS investment to new heights. India, for one, is quite enthusiastic as it has a vibrant private sector and its top companies have acquired a healthy global appetite. Russian companies are also thirsting to expand their footprints in the emerging world. Clearly, there is a strong economic rationale that underpins the BRICS grouping of emerging economies, but the Durban summit and the road to Brasilia will be marked by a greater infusion of geopolitical content and intensified consultations on key international issues. Be it Syria or Iran in the Middle East or festering crises in Mali and Central African Republic, one can expect BRICS leaders and officials to be in close consultation. The eThekwini Declaration’s positions on Syria and Iran reinforce the emergence of the BRICS as a powerful counterpoint to the West-dictated agendas on burning international issues and the world will be watching closely how the BRICS countries align their positions and force the status quo powers to negotiate more balanced solutions to international security issues. In fact, the days to come will see a steady and incremental deepening of strategic and security content of the grouping that is widely seen as focused on economic issues. The Durban summit has regularised the stand-alone meeting of national security advisers and underlined key the need for intensified intra-BRICS cooperation in dealing with a host of security threats ranging from terrorism and piracy to cyber warfare. Another big takeaway from the Durban summit was the focus on Africa, a resurgent continent that is rapidly navigating its way to renaissance and renewal. In fact, some of the fastest growing economies are now in Africa, and the world is looking at the continent afresh as a land of unbounded opportunity. 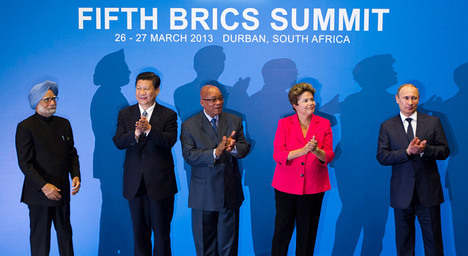 The Durban summit had a separate retreat of BRICS leaders with several leaders of African countries. It’s not quite clear what was discussed behind closed doors in the picturesque Zimbali Lodge resort, but officials privy to discussions say that African countries welcomed the surge of BRICS’ interest in the Africa growth story. In the eThekwini Declaration, BRICS leaders robustly backed calls for greater infrastructure investment in Africa, voiced support for development agencies and endorsed regional integration plans. Given the much-touted speculation about the potential for completion and rivalry between India and China in Africa, it will be interesting to see how senior officials dealing with Africa in the BRICS countries manage to come out with win-win opportunities to leverage the African resurgence for their own prosperity and co-development of the larger global South. The road from Durban to the next summit in Brasilia, therefore, promises an exciting and rewarding journey for what Russian President Vladimir Putin, using an African metaphor, called the “Big Five” of the emerging world, but it’s a road that is also going to be strewn with pitfalls and landmines, that if not trod carefully could blow up the emerging edifice of the grouping that seeks to recast the West-dominated world order. This would entail delivering on promises of the Durban and New Delhi summits – getting the bank in place by the 2014 summit. No deadline has been set in the declaration, but India’s Finance Minister P. Chidambaram is confident that the edifice of the Bank will be ready by the time Brazil starts the second cycle of summits in the summer of 2014. One is also hoping to see more big-ticket intra-BRICS investment deals and more networking between private businesses of the five countries. Another important challenge for the grouping will be to deftly manage occasionally conflicting perceptions and competing national agendas on key issues so that one can justifiably talk about the collective BRICS position and even talk of BRICS-led initiatives in defusing international crises. Lastly, but perhaps most important, the leaders of BRICS countries, despite variations in their economies and national ambitions, should avoid the temptations of one-upmanship and seize the opportunity to reassert the BRICS solidarity. Equity, therefore, should be the guiding principle in both letter and spirit. If the BRICS grouping seeks to achieve their overarching goal of reconfiguring the existing world order, they sail or sink together. There is really no half-way house here. Manish Chand is Editor-in-Chief of India Writes. He was in Durban for the 5th BRICS summit.